You asked… we listened! Join us at The Barker Hotel to welcome back ‘SATISFACTION the stones show’ to perform ‘Moves like Jagger’ as apart of the Fringe Festival! 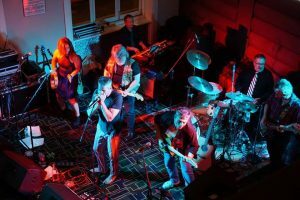 ‘Satisfaction the Stones Show’ have been treading the boards for over 20 years now and have earned the reputation as one of the best musical tribute acts in the country. Expect a high energy 2 hour show (plus interval) featuring not only the hits but also the classics faithfully reproduced by an 8 member concert band featuring some of the country’s finest musicians. Singer Marty Jackson not only sings like but also ” Moves Like Jagger” hence the name of our show which has been produced by Jim Sharman.